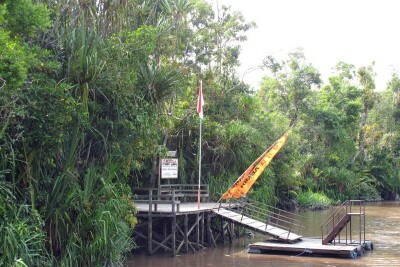 Tanjung Puting National Park is the largest protected forest in central Kalimantan (Indonesian Borneo). The park protects 3,040 sq km of lowland dipterocarp and peat swamp forest and is home to the highest density (over 6000) of wild orang-utans in the world. The best wildlife viewing is at Camp Leakey, situated two hours upstream from Rimba Eco Lodge. Camp Leakey was set up in 1971 by Dr Birute Galdikas and named after her mentor, Dr Louis Leakey, the famous Kenyan paleoanthropologist. Chief researcher Dr Galdikas, together with Jane Goodall and Dian Fossey, worked with Leakey to form many of the current theories on primate behaviour and biology. The camp’s mission is to support research into orang-utans and, over the years, scientists there have studied hundreds of the great apes. The site is also one of the foremost rehabilitation centres for orphaned orang-utans. In 1995, new regulations in Kalimantan prohibited the reintroduction of orang-utans into areas already supporting healthy wild populations to prevent the risk of disease transmission. This has resulted in a healthy population of orang-utans at Camp Leakey, with a mixture of rehabilitated, descendants of rehabilitated, and wild but habituated orang-utans, and you are likely to have good sightings including large males, new born apes and infants. Other species regularly seen in the park include agile gibbons, bearded pig, black-eared pygmy squirrels, proboscis monkeys, long-tailed macaques, silvered langurs and Malaysian false gharial crocodile.